A few weeks ago, we did an in-depth review of Ubuntu 11.04 when compared with Fedora 15. One of the interesting little features we missed was Quicklists in Unity. Quicklists allow users to access common menus, or perform common tasks within a program by right-clicking the launcher icon. The feature is very much similar to Jump Lists in Windows 7, which could be accessed by right-clicking the Windows task bar. Applications, like Browsers and Media Players use these Jump Lists to let the user access documents and tasks associated with the current application. Unity on the other hand being freshly baked from the oven, there aren't many applications that take advantage of the Quicklist features. 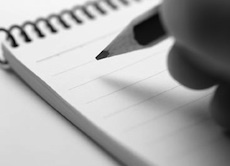 Here's a quick tip that will let you enable Quicklists for both Google Chrome and Firefox. 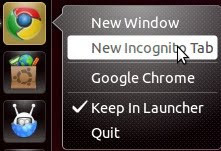 Google Chrome and Chromium don't support Quicklists by default; however, with a little tweaking the feature can be enabled to support incognito mode. Here's the whole process in 2 easy steps. Step 3: Now that the file is opened, paste the following code at the end of the file. When done, press Ctrl+S and close the window. 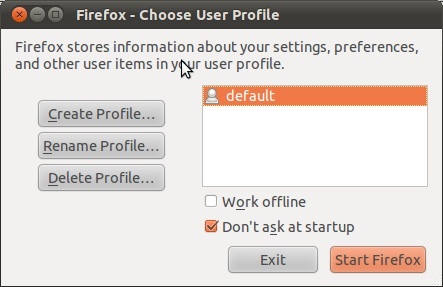 Firefox 4 can also be tweaked to show various options in the Quicklists. These options allow users to open a new window, toggle the Private browsing mode, start the Profile Manager, and use the safe mode. 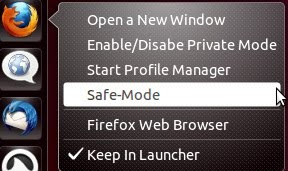 The safe mode starts Firefox without any extensions or plugins. The profile manager can be used to access different profiles before starting the actual session. Step 1: Backup the file.. Step 2: Open the terminal and type in.. This line will be followed by some code. Now, delete the line and the lines below it. Step 4: Add following code to the file, press Ctrl+S and exit. If the menu doesn't show up, remove the launcher from the Unity bar by right-clicking and unchecking the option titled “Keep in Launcher”. Then search for the program and drag it to the Unity bar again. The Quicklist should be visible by now. If something goes wrong, type the following commands. These commands will restore the original ‘.desktop’ files and delete the modified ones, taking things back to normal. Thanks for the info! In your chrome backup command you are actually backing up the firefox.desktop though a backup is not entirely necessary here anyway. I have updated chromium.desktop file and i can see submenu modes in unity for chromium but when i click on it, it won't start?? Should i something enable?